Home Expert Advice Skincare Advice Acne & Breakouts What Are These Tiny White Bumps on My Face? Small, hard, white bumps, which show up mostly on the face, especially around the eyes, can happen to just about anyone, including infants. These frustrating yet benign bumps are incredibly stubborn, and can last for weeks, months, or even longer! There’s a right way and a wrong way to remove them, and doing it the wrong way can damage your skin. Following our recommendations should help you safely resolve these bumps, and possibly keep them from returning! 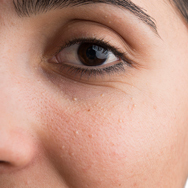 In most cases, these tiny, hard, white bumps will go away on their own without treatment. Being patient and waiting it out is one option—but waiting it out is not for everyone! These bumps can form when the skin’s natural exfoliation process malfunctions, in which case using a targeted exfoliating treatment with salicylic acid (BHA) can help. Using a BHA immediately improves exfoliation, which can prompt the bumps to dissolve on their own relatively quickly. If your skin doesn’t respond to using a BHA exfoliant after several weeks, make an appointment with your dermatologist, who can tell you if you’re dealing with something known as milia or a different issue, and what the best remedies are. Along with a BHA exfoliant, it’s essential that you use an anti-aging skincare routine to minimize the chance of them reappearing. This means always using a gentle cleanser, toner, and leave-on products with skin-restoring ingredients. You also need a daytime moisturizer with at least SPF 30 to protect your skin every day. An effective routine like this will help reduce the possibility of those annoying white bumps showing up on your face again! The White Bumps Are NOT Pimples! If you’ve experienced these white bumps on your skin, you’ve likely wondered if they were a pimple or some type of breakout. Many people mistake these tiny, pearl­like bumps for acne, but they are not the same thing. One of the easiest ways to differentiate the two is by how they feel. Unlike acne, these bumps are rather firm, and squeezing has little to no impact on them. Also unlike acne, they can show up around the eyes and on parts of the face where there aren’t any active oil glands. They also don’t have the pain that’s associated with acne, when a pimple forms and then becomes red and sore. Because these bumps are not pimples, it’s critical that you do not treat them like they are pimples; the anti-acne ingredient benzoyl peroxide will have no impact. It’s also critical that you not squeeze, scrape, poke, or in any other way physically try to remove these bumps from your face, as you would a pimple. Because the bumps are hard and begin beneath the skin’s surface, these methods are very unlikely to help at all. Instead, you might wind up irritating and damaging the skin surrounding it. To sum up: An at-home gentle skincare routine that contains a BHA exfoliant should help get these bumps under control. But, if a consistent routine doesn’t lead to visible improvement after several weeks (remember, these bumps can be stubborn! ), then it’s time to consult a dermatologist. Learn more about bumps on skin.